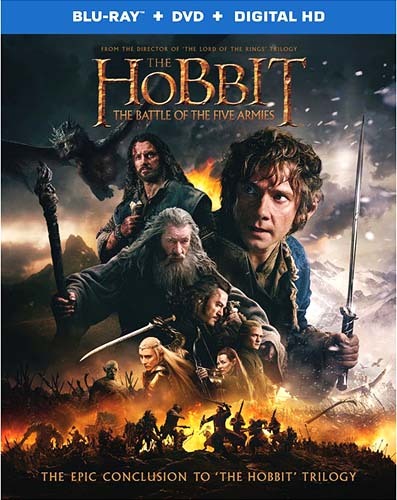 Principal Cast: Ian McKellen, Martin Freeman, Richard Armitage, James Nesbitt, Ken Stott, Graham McTavish, William Kircher, Stephen Hunter, Dean O'Gorman, Aidan Turner, John Callen, Peter Hambleton, Jed Brophy, Mark Hadlow, Adam Brown, Orlando Bloom, Evangeline Lilly, Lee Pace, Benedict Cumberbatch, Mikael Persbrandt, Sylvester McCoy, Cate Blanchett, Luke Evans, Stephen Fry, John Bell, Hugo Weaving, Christopher Lee. Principal Filmmakers: Peter Jackson, Director; Producers: Carolynne Cunningham, Peter Jackson, Fran Walsh, Zane Weiner; Screenplay: Fran Walsh, Philippa Boyens, Peter Jackson, Guillermo Del Toro from the J.R.R. Tolkien novel; Original Music: Howard Shore; Director of Photography: Andrew Lesnie; Film Editing: Jabez Olssen; Production Design: Dan Hennah; Supervising Art Director: Simon Bright; Set Decoration: Ra Vincent; Costume Design: Bob Buck, Ann Maskrey, Richard Taylor; Makeup & Hair Supervisor: Rick Findlater; Prosthetics Supervisor: Tami Lane; Special Effects Supervisor: Robert Gillies, Phil McLaren; Senior Visual Effects Supervisor: Joe Letteri. There are three package disc sets being offered of the theatrical version of the film from U.S. and Canadian sources on 24 April 2015. All three contain a DVD of the film and a second disc of extras that contain: Recruting the Five Armies, Completing Middle-earth, The Last Goodbye: Behind the Scenes, The Last Goodbye Music Video, New Zealand: Home of Middle-earth (part 3). The box contains a sheet with the code for accessing the "Ultraviolet" copy of the film for use on a mobile device. The DVD only version is a 2-disc set, whereas the 2D Blu-ray offering is a 3-disc set (2- BD, 1-DVD) and the 3D Blu-ray offering is a 5-disc set (3-BD, 2-DVD). All versions display the feature film in 2.35:1 format (anamorphic) with 5.1 surround language soundtracks in English, French, Spanish. The Blu-ray versions have a DTS-HD 7.1 Master English soundtrack. After those basics come the additions and variations. The US and CA versions also have English, French and Spanish subtitle options with the feature film. The 2-disc DVD set is selling for $15-20us; The 3-disc set is selling for $20-30us; the 5-disc set sells for $27-40us. August 2015 Warner Bros. Home Entertainment announced that the Extended Edition release is scheduled for 17 November 2015. There will be a 2D 3-disc package and a 3D 5-disc package. The feature will contain 30 addition minutes and unlike the theatrical edition, has been rated R. There are over nine hours of extras including Appendices Parts XI and XII that showcase a chronological history of the filming, documenting the work done on-set through the three shooting blocks and in the world of its digital effects. The extras also contain Part 3 of 'The Home of Middle-earth'. The box contains a sheet with the code for accessing the "Ultraviolet" copy of the film for use on a mobile device. Rebecca Pahle's Review at 'The Mary Sue'. Smithsonian.com's Rachel Nuwer reflection on the Trilogy.